So penned Fr. 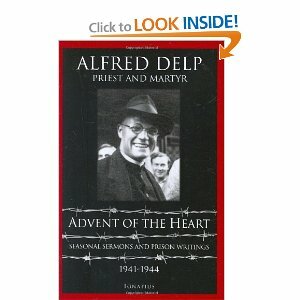 Alfred Delp in the last Advent of his earthly life, from a Nazi prison. Over On the Square at First Things, William Doino Jr. has a beautiful meditation on the prison writings of Fr. Delp. Here are a few excerpts, but do take the time to read the whole article! Every temptation to live according to other conditions is a deception. Our participation in this existential lie is really the sin for which we today—as individuals, as a generation, and as a continent—are so horribly doing penance. The way to salvation will be found only in an existential conversion and return to the truth. Finally, insists Fr. Delp, we should always be joyful in anticipation of the glory that awaits us; we should persevere in this life, knowing that our faith in Christ is the indestructible fact that gives it meaning. We should not avoid the burdens God gives us. They lead us into the blessing of God. To those who remain faithful to the ascetic and hard life, the interior springs of reality will be unsealed, and the world is not silent as we might have thought. The silver threads of God’s mysteries within everything that is real begin sparkling and singing. The burden is blessed, because it has been recognized and carried as a burden from God. God becomes man. Man does not become God. The human order remains and continues to be our duty, but it is consecrated. And man has become something more, something mightier. Let us trust life because this night must lead to light. Let us trust life because we do not have to live it alone. God lives it with us. Do read Meditations for The End of Advent. You won’t be sorry! This entry was posted in Holiness, Liturgical Year and tagged Advent. Bookmark the permalink.